The present College of Fine Arts has a history of more than 100 years even though it changed its name and belonging many times. Founded in1881 by the then king of Travancore His Highness Visakham Thirunal Rama Varma as His Highness Maharajas School of Arts. 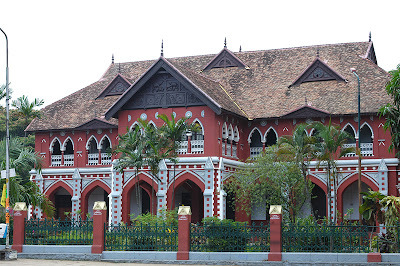 Later on in the 20th century, administration of the school was transferred to The University of Travancore. In 1957 after the formation of first democratically elected government in Kerala, the School of Arts was brought under the Directorate of Technical Education. 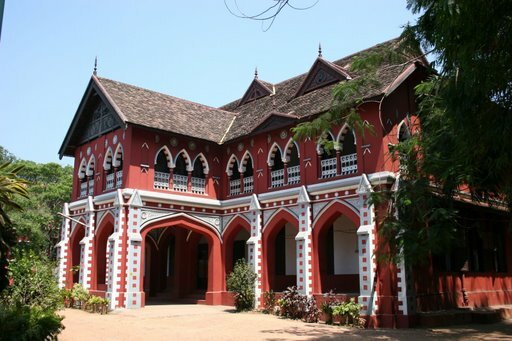 In 1975 the school was upgraded as the College of Fine Arts and got affiliated to the University of Kerala. From 1979 onwards the college started Bachelor of Fine Arts (BFA) courses in three disciplines - Painting, Sculpture and Applied Art. In the year 2001 the college celebrated its Silver Jubilee Year with exhibitions, seminars and workshops. Over the years a number of distinguished artists and art educators of the country have nurtured the college. Veteran artists and scholars like the late K. K. Hebbar, the late N. S. Bendre, Prof. Gulam Sheikh and Prof. Hanumante visited the institute and inspired and students.. Currently the college is under both the Kerala University (for examination) and Directorate of Technical Education (for administration). The college over the years has produced some of the finest painters, sculptors and designers many of whom are internationally renowned artists today in their own right. The college offers Bachelor of fine Arts (BFA) courses broadly in three disciplines Painting, Sculpture and Applied Art. Duration of the course is 4 y ears, after the completion of 4 years students have to appear for the examination conducted by The University of Kerala. Thiruvananthapuram, Kerala, India. PIN 695 033. The college offers Bachelor of fine Arts (BFA) courses broadly in three disciplines - Painting, Sculpture and Applied Art. Duration of the course is 4 years, on the completion of 4 years students have to appear for the examination conducted by The University of Kerala. The curriculate of the first year of the four-year BFA Degree Course is an integrated course for all students and acts as a foundation to the BFA specialization courses. The student who pass the first year University Examination are alloted one of the three specializations according to their talent and choice. The flagship Department of College of Fine arts Trivandrum, BFA Painting is a three years course after the students who complete one year in the integrated course. Every year 10 students get to study in the painting department. The 3 year course includes detailed human study, learning in composition, experiments in various media, exposure to etching, lithography and mural, history of art, ae sthetics, etc. But what makes the department different from other institutions is the emphasis given for the development of student's individual vision and expression. The department BFA Sculpture, whose alumni list boasts of a number of internationally acclaimed sculptors,is a 3 year course. The students who have completed one year in the integrated course. Every year 10 students study in the Department of Sculpture. The 3 year course includes detailed study of human body and structure, learning in composition, understanding of space, experiments in various media like clay, plaster, cement, fiberglass, wood, stone, bronze, terracotta; theoretical study of aesthetics and the history of art. Even though it involves a lot of technical study the emphasis in the course give emphasis to help the student become a sculptor with individual vision and the ability to express it through his/her choice of media. BFA Applied Art is a 3 year course for students who have completed 1 year integrated course. 20 students are enrolled for applied art graduation every year. In this 3 year course students get introduced to subjects such as typography, illustration, photography, graphic design, computer graphics, printing and theoretical study of advertising and marketing. The course is designed to taking into consideration the growth in the industry, public welfare, information technology and advertising, the areas wherein an Applied Artist can contribute. The course prepares the students to develop individualistic vision and the confidence to take on any communication challenge. Since the very nature of the course has links to the industry, the biggest challenge this department faces is its geographical location in itself. As Thiruvananthapuram is not an industrial city, students lack the opportunity to get the much needed exposure to the changing trends and experience in the industry. In spite of this drawback many products of this department have become veterans in various industries in and outside the country. Qualification: Candidates who have passed Pre-Degree, +2 or any equivalent examination. Aptitude Test: Candidates have to pass an aptitude test and an interview for admission. Details of the test will be published at the time of admission. Date of issue of application: Will be announced by April, 2006. Date to submit the filled applications: Will be announced by April, 2006. Date of Aptitude Test:Will be announced by April 2006. Date of Interview: Will be announced by April, 2006. Date of commencement of the course: Will be announced by April, 2006. MFA in Painting from Central University cf Hyderabad. Contribution to the field: Served as Computer animation consultant for C-Dit, Did video and film animation projects for Kerala State Film Development Corporation, Delivered lectures on aesthetics at Kerala Lalit Kala Academy also conducted workshops on computer graphics and new media at C-DIT,Aptech. Work present in collections of Kerala Lalit Kala Ac ademy, Central academy regional centre Chennai, and many eminent private collectio ns. Contribution to the field: Participated in several international/national art exhibitions. Convened and participated in Sculpture Workshops. Contribution to the field: Participated in various art exhibitions in the country. Won awards for sculpture in the A nnual Art Exhibitions conducted by the Kerala Lalit Kala Akademi. Contribution to the field: Participated in several important art exhibitions in the country. Head of Dept Applied Art . Contribution to the field: Designed Type Phases of Malyalam for Indian Typographical Research Institute, Pune and also for State Institute of Languages, Kerala. Designed and illustrated books for children. Participated in Art Exhibitions. Organised workshops on design & Illustration. Contribution to the field: Carried out various assignments relat ed to design. Contribution to the field: Worked as an Art Director in an advertising agency and has designed advertisements, posters and corporate identity. Contribution to the field: Carried out various assignments related to design.